Happy early Valentine’s Day from the Crawford Willis Group! From roses and giant stuffed bears, to chocolate covered hearts, Crawford Willis Group has you covered on your Valentine’s Day needs. Are roses and chocolate coated food products too traditional for you? Listed below is a fun and unique twist on how to spend this Valentine’s Day with that special someone in your life, be it a friend or your significant other. “This Valentine’s Day, Chicken is the New Chocolate!” These are the wise words of our beloved Chick-fil-a! With Valentine’s Day approaching quickly, many of you are left unsure about your options. 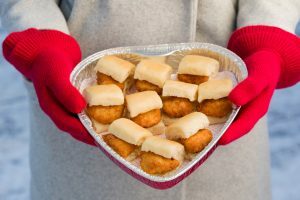 If you’re looking for something unique for that special someone in your life, swing by a participating Chick-fil-A to pick up a 30-count of Chick-fil-A Nuggets, 10-count of Chick-n-Minis or 6-count of Chocolate Chunk Cookies in a heart-shaped container-love is in the air and this year it smells like chicken! I don’t know about you, but I could never have too much Chick-fil-a. Want to do something a little more traditional? Then listed below are some simple things you can do to spread the love this Valentine’s Day. It’s all about the little things. Whether saying “I love you” a little extra, paying for a friend’s routine coffee for the day, or giving someone a compliment, a little goes a long way! Everyone loves staying snuggled up in your cozy bed for as long as possible, especially in this cold weather! Why not spend that extra time eating your favorite Chick-fil-a breakfast item? Today is the day to pamper yourself more than you usually would! Put on your favorite show or movie, go get that mani, pedi, and/or massage you’ve been “too busy” to do, eat something you usually wouldn’t, or go meet your friends at your favorite lunch spot! Here is a list of some places that would either be a good option for a romantic dinner for two or a wonderful present to give that special someone. Again, the Crawford Willis Group would like to with a Happy Valentine’s Day to all of our readers and past clients.